The Marine Discovery Center got a little surprise from a burrowing reptile after it had started construction this spring. 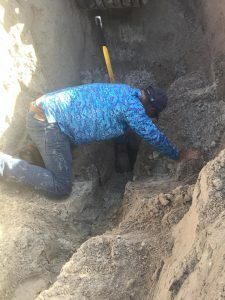 Executive director Chad Truxall was walking the center’s campus in early April and noticed a hole in the base of what will be the seating area of the new amphitheater, currently under construction. Truxall said that a survey on the property for endangered and threatened species was standard procedure before construction could begin. Unfortunately, an assumption was made that the survey had already taken place. The Florida Fish and Wildlife Conservation Commission (FWC) informed MDC that it needed to determine if there was one tortoise or more than 10 on the property. Procedural requirements vary based on the number of animals present. 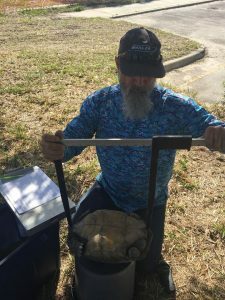 Truxall reached out to Joe Young, owner of Biological Consulting Services who came to the center’s campus in early April and performed a gopher tortoise survey one week after construction had begun at the site. Young arrived with a measuring instrument, which he snaked into the burrow to determine the size of the hole and the location of the tortoise. Once he determined there was one tortoise in the burrow, all construction within 15 feet of the area was halted until the animal could be removed. 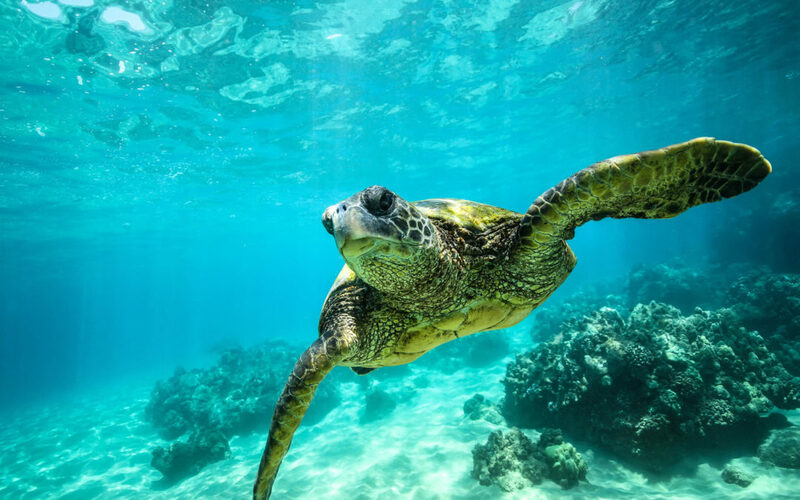 The first option would be to install a silt fence around the entire construction project and the tortoise could be removed and placed outside the silt fencing. The fencing would have to be dug into the ground for several feet around the site. The price was substantial for the process. The second option would be to extract the tortoise in its burrow and move the animal offsite to a different location within 100 miles. The site would be a designated area approved by the state for a gopher tortoise. On the day of the tortoise extraction, Truxall watched nervously from a distance while the process took place. Young and Weaver Construction — which both donated their services to the nonprofit — executed a precise extraction using a backhoe. 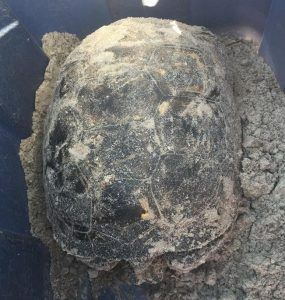 The burrow was approximately 20 feet deep and during the course of the extraction, the tortoise made several U-turns in its shelter, Truxall noted. The extraction rendered a large female tortoise, which was relocated to a state-approved area. MDC paid for the permitting from the state and the relocation of the tortoise. 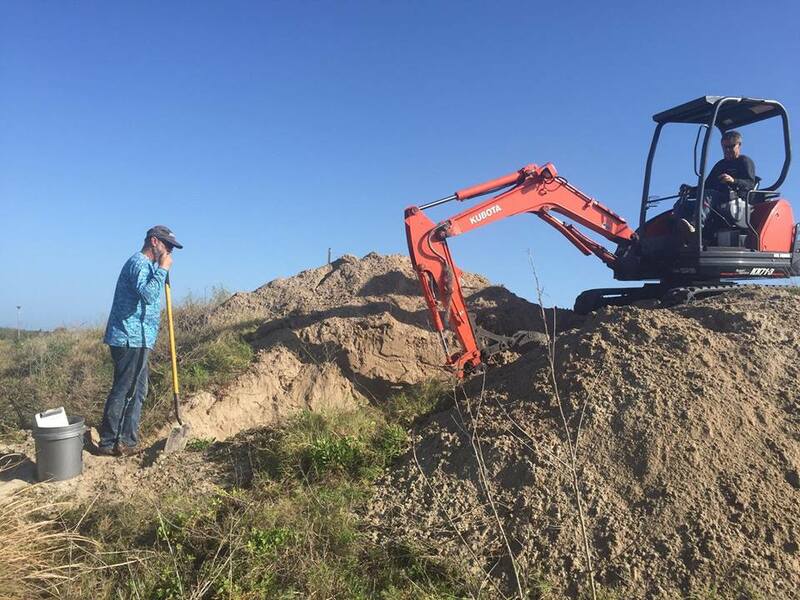 FWC banned the practice of entombment in 2007, ending a state policy that allowed construction companies to bulldoze burrows for a paid permit. The Humane Society took action in halting the statewide practice, which reportedly entombed anywhere from nearly 100,000 to 900,000 gopher tortoises in Florida from 1991-2007. In addition to being a creature commonly seen in residential Florida communities, Truxall noted that gopher tortoises are important because they are a keystone species. Their burrows provide refuge for many animals, ranging from mammals and reptiles, amphibians, insects and birds. More than 350 other species have been identified as commensally residing in gopher tortoise burrows. Certain endangered species, such as indigo snakes, the gopher frog and the beach mouse, all share gopher tortoise burrows. They will use the burrows throughout their life cycle, but they will also take refuge in the burrows during fires. 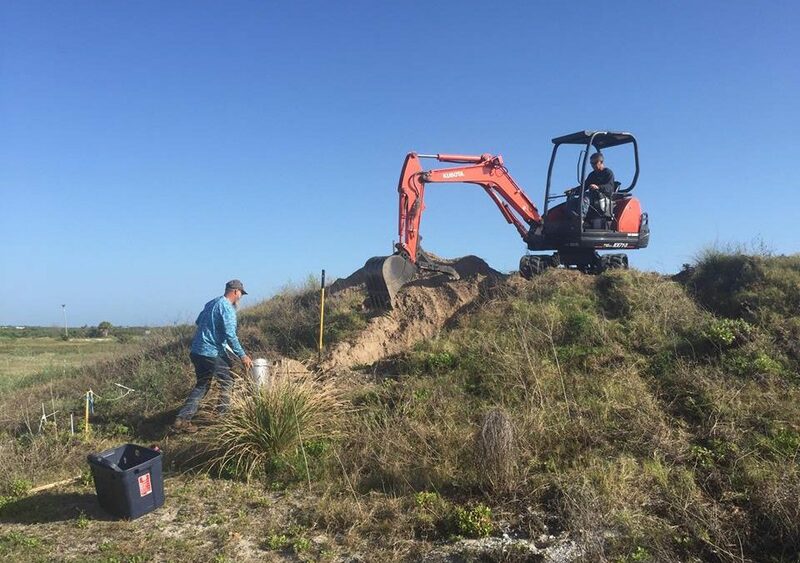 While some humans may be inconvenienced that the presence of a threatened animal could hold up an entire construction project, Truxall said state laws are now in place for a reason to protect gopher tortoises. I reached above my head through the mangrove trees for the lifeless brown pelican hanging in the limbs of the bird rookery island. The beautiful bird was still soft and its wings were still supple enough for me to easily pull down the carcass to look for fishing line and to examine the metal band around its ankle. Only hours ago, this bird was still alive — likely thinking about fish and possibly, about choosing a mate as the season of courtship filled the air. 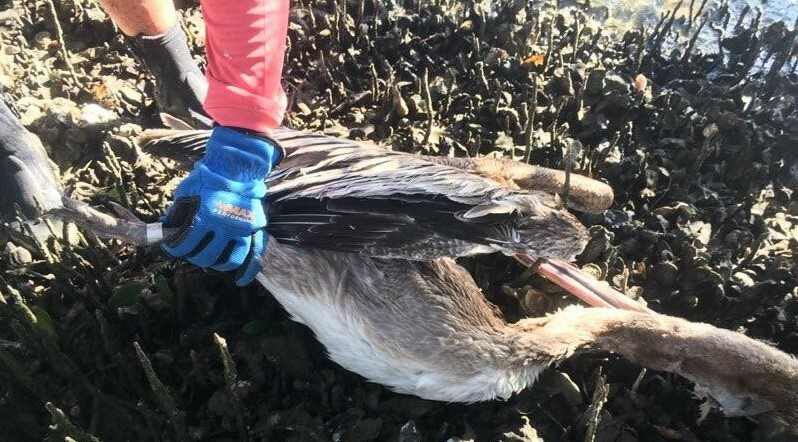 Sadly, this creature was now one of eight dead birds, including two banded brown pelicans, our small team encountered as we scoured the two rookery islands on the Atlantic Intracoastal Waterway and Indian River Lagoon during our annual cleaning of the islands. 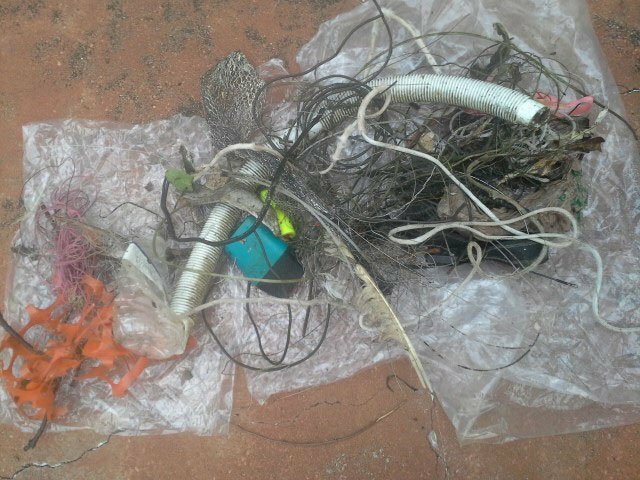 We were here for our mid-February eradication of monofilament fishing line. 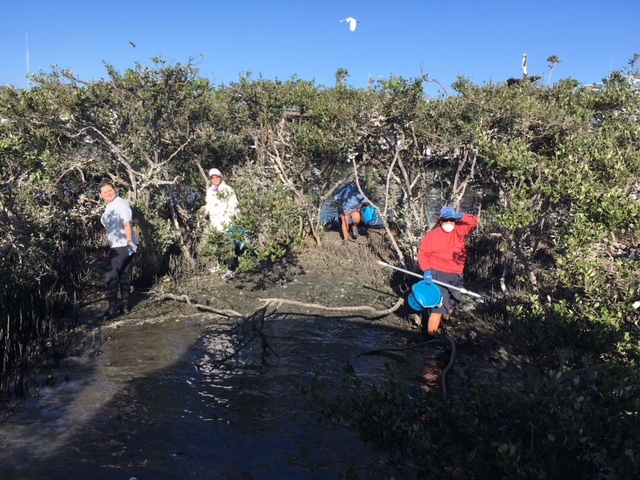 Our small team of three naturalists, a boat captain and an office worker from the Marine Discovery Center fanned out on each island with scissors, snips and buckets to cut down as much line as we could find. 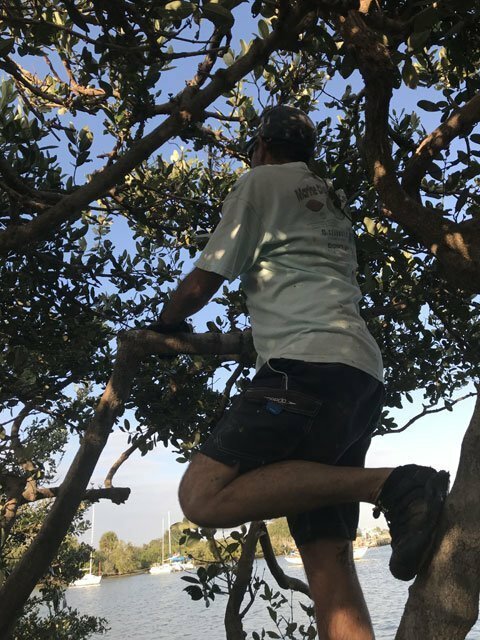 And as always, the goal was to remove monofilament fishing line from the mangrove trees in an effort to offer a less hazardous future to the birds coming here to nest. Even when the birds aren’t nesting here, as they do each February through October, a large number of them regularly roost and loiter on these islands. This is home base to many of our wading birds, as evidenced each night at twilight when flocks of ibis helicopter in for a safe place to sleep until the next day’s sunrise. Seven species of birds return here each year to find mates, build nests, lay eggs and watch the next generation take flight. 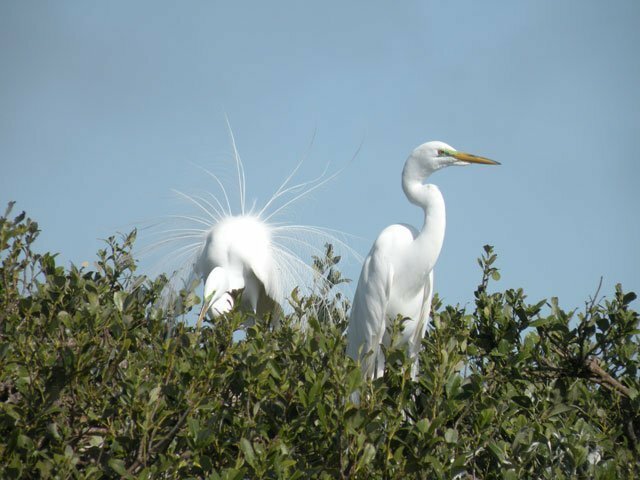 At peak nesting season, anywhere from 140-200 nests with two to three eggs per nest adorn the branches of the mangrove trees. It is noisy, smelly, but full of life. Our 2018 clearing of the islands was highlighted by the chance to free an entangled double-crested cormorant, which gleefully flew toward open water. We were also surprised that some bird had seemingly collected an electric extension cord for use as nesting material. 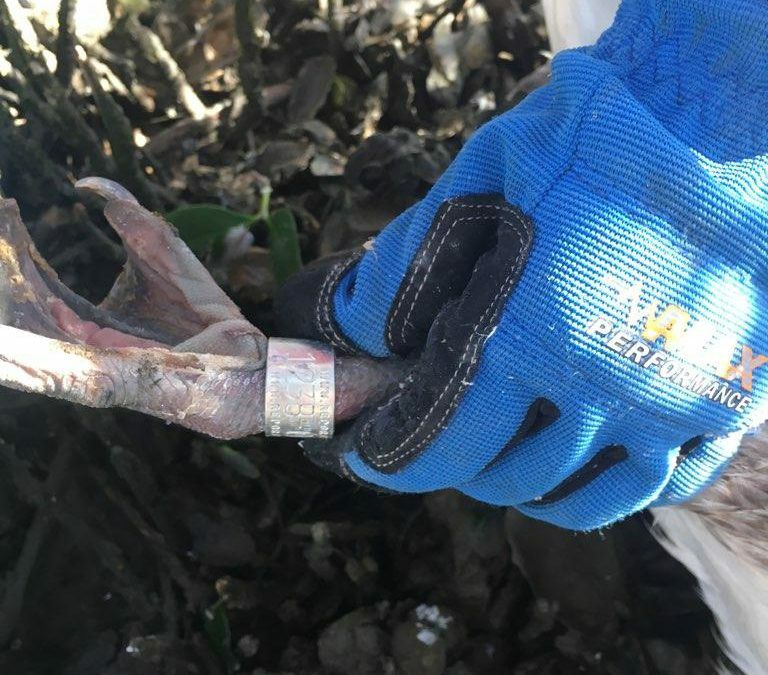 And when I reported the numbers on the bands worn by the two deceased pelicans to a governmental agency, I was surprised to learn they both had been banded last year in Virginia. 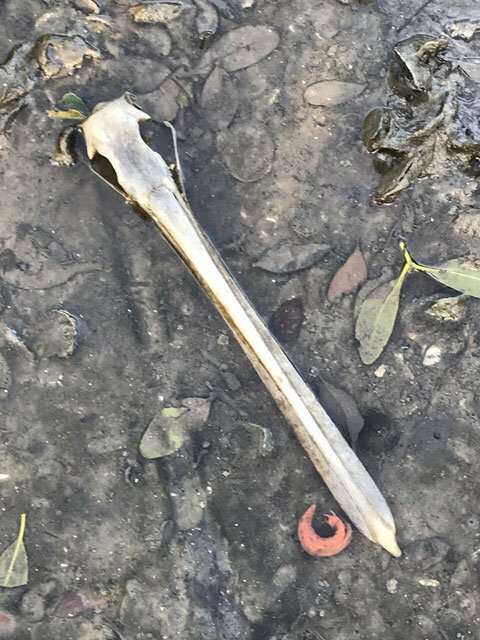 Sadly, the migration for one adult and one juvenile pelican ended here. Certainly, the challenges for our rookery islands grow each year as New Smyrna Beach develops and more people engage in water sports. As more boats and buildings cast shadows on these creatures, they are, at least, guided by their instincts to return to these gnarly mangrove islands to do what their DNA tells them to do each year. The pendulum of nature swings with or without us, but increasingly, the birds on the rookery islands can use an assist. We can lend a hand to help them, but most of all, we should extend the effort to clean up what we humans have left behind. Turtle-tracking volunteers and Canaveral National Seashore staff were busy during the 2017 nesting season with record-setting numbers of turtles finding the beaches of Volusia County. Volusia County’s beaches experienced its second-highest nesting season since 1988 (when records were first kept) with 720 nests in 2017. Of the documented nests this year on Volusia County beaches, 634 nests were loggerhead sea turtles, while 82 were green sea turtles and four nests were the Kemp’s Ridley sea turtles – uncommon for this region. Those numbers shattered records for both greens and Kemp Ridley turtles, and was the third-highest number on record for loggerhead nests on Volusia County beaches. In Canaveral National Seashore, which spans both Apollo Beach (Volusia County) and Playalinda Beach (Brevard County), a total of 12,315 nests were recorded. 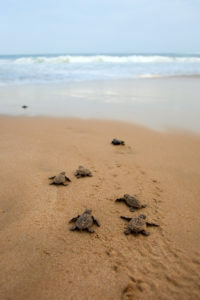 In Apollo beach, there were 1,791 loggerhead nests, 2,192 green turtle nests and seven leatherback sea turtle nests. 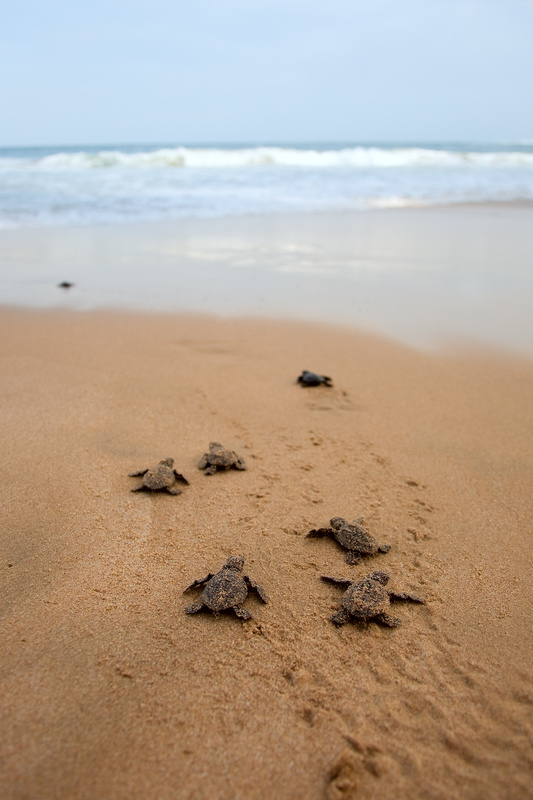 In Playalinda, rangers recorded 2,765 nests for loggerheads, 5,544 nests for green turtles and 16 leatherback nests. No Kemps Ridley nests were recorded on either beach in Canaveral National Seashore. Some of the nests were damaged or lost with the arrival of Hurricane Irma this fall in both the national park and on Volusia County beaches. 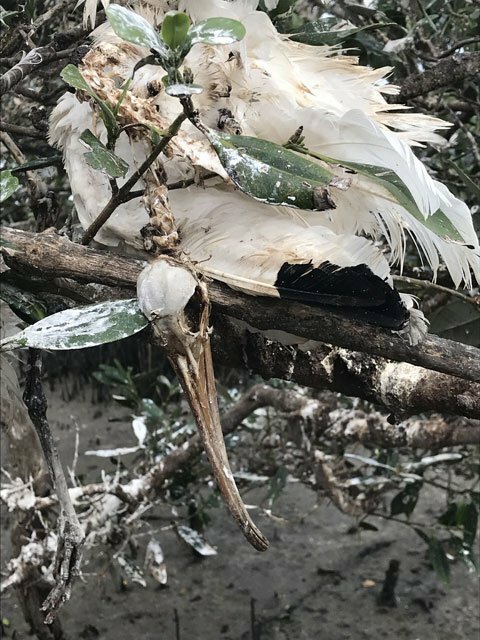 In Volusia County, 262 nests could not be fully evaluated because: nests could not be located (30); nests were depredated or scavenged (37); tidally inundated (42); or washed away by the sea (153). 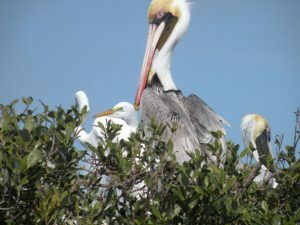 And while nesting season in Volusia County is typically in full swing from May 1 through October 31, nesting is not always exact – as there were still 15 nests incubating on the beach after Oct. 31. As the 2017 numbers indicate, sea turtle conservation on the shorelines of Volusia County was viable and productive, once again. I admit it. I’m as guilty as anyone else when it comes to admiring top sports teams and appreciating the skills of world-ranked athletes. I love seeing them work together as a team to win championships or close games. And I enjoy watching individual professional athletes perform extraordinary feats. Certainly, as a sportswriter for more than 20 years, I have seen my fair share of record-breaking performances, met some exceptional athletes and seen history made in athletics that will forever be on instant replay in my mind. But in recent years, I’ve met some new superstars who work in virtual anonymity and deserve far more attention than any of them would ever want. Their names are not well known and they don’t reap lucrative benefits for the long hours of plying their craft even though they are among the world’s best. There’s no confetti, headlines or applause from thousands of adoring fans for these people. In fact, most of the time when they perform their best work, they are alone, dirty, bloody and in environments where even their best friends might decline to go. Their incentive is not fame and fortune, but rather, an intrinsic curiosity to answer questions, solve problems, and detail those findings in documents that can be used by others. Who are these people? They are scientists. And these scientists are everyday people who are committed to research often involving specific species and specific habitats. They regularly deal with evolving changes that affect the living organisms they study and they are unabashedly passionate about the focus of their studies. Their fist pumps are cerebral, at most. For example, I recently reached out to the scientists at the Smithsonian Marine Station in Fort Pierce, Fla., to inquire about a blue land crab (cardisoma guanhumi) that was showing up in my neighborhood in Central Florida. Scientist Sherry Reed kindly responded and informed me that Hurricane Irma had spawned a migration of these crabs as they move from salt marshes to the ocean at this time of year. That kind of passion for a species and commitment to understand their existence is exactly why I believe we should thoughtfully consider who our real heroes are and why. Scientists most often specialize in a focus area and spend countless hours and years documenting their species. Both when things go right and when things go wrong, they still seek answers to questions. How many times have I listened to Lori Morris of St. Johns River Water Management District passionately discuss the importance of seagrass in the Indian River Lagoon? And when an algal bloom in 2011 killed 47,000 acres of precious seagrass in the estuary, why was I not surprised that Morris was out in the water with other scientists, hand-planting grasses and later snorkeling to monitor its progress? How can I not get excited about oysters and shoreline restoration when Dr. Linda Walters of the University of Central Florida starts talking about the work she has done with oyster-shell recycling for nearly two decades? If you ever work with her on one of these shoreline projects, it’s like spending a day with the Johnny Appleseed of oysters. 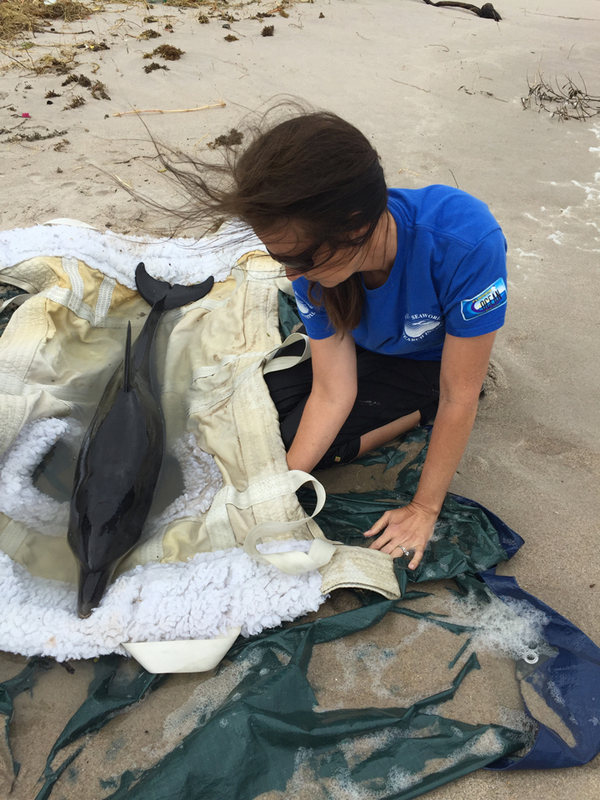 I’ve also logged time on the water with Wendy Noke of Hubbs-SeaWorld Research Institute looking for sick and injured dolphins. I’ve watched Wendy suspend her great affinity for specific animals she had monitored for years when it came time to perform necropsies to determine what had killed them. 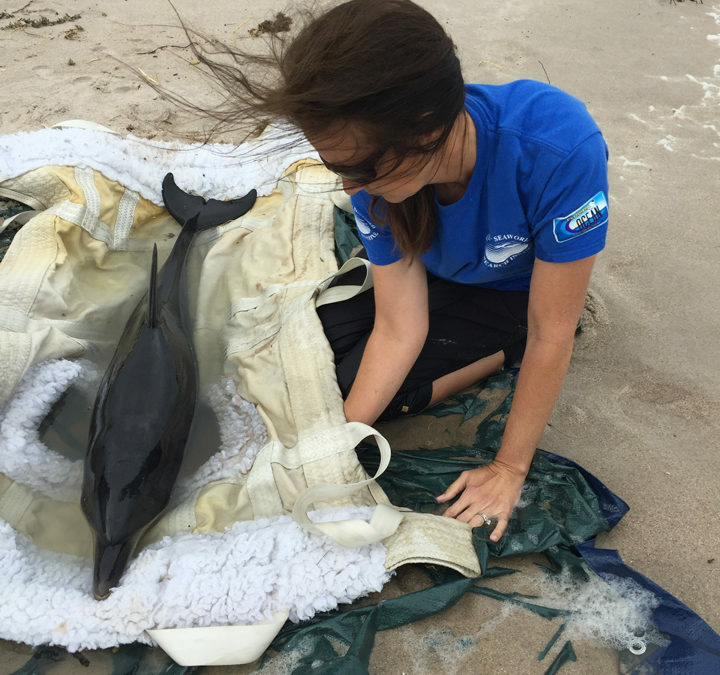 A few years ago, when a deadly virus swept the offshore dolphin population, I knew I could find Wendy with a scalpel in her gloved hands, harvesting tissue for pathology results – sometimes twice a day. Maybe even Wendy wanted to cry at the loss of so many magnificent animals, but there was too much work to be done in the name of science. If you want to get excited about sharks, listen to George Burgess talk about his favorite species. Burgess is the director of the Florida Program for Shark Research at the Florida Museum of Natural History in Gainesville, Fla. He has spent his career following these animals and documenting their behaviors and statistics. 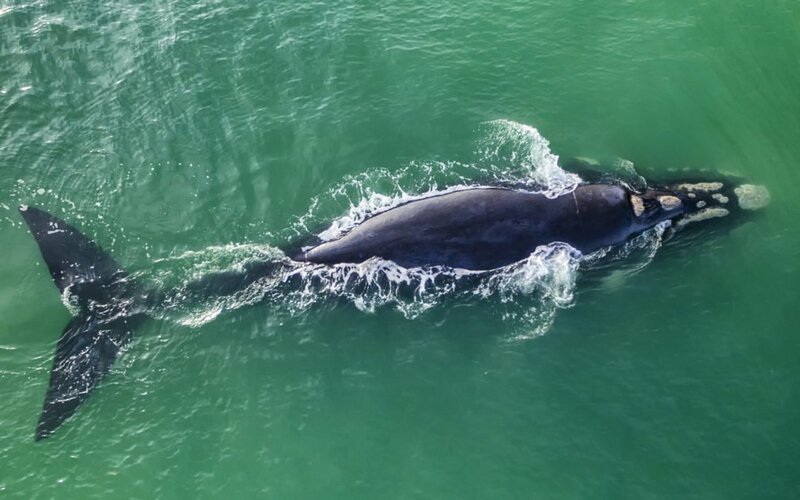 He can tell you where not to swim in New Smyrna Beach, based on shark-bite statistics and baitfish prevalence, but he can also espouse the miracles and mysteries of these animals from a lifetime of research. A few times, I’ve had the privilege of walking at the elbow of Dr. Jane Brockmann, a professor emeritus at the University of Florida, who has studied horseshoe crabs for more than 30 years. Once I was with Dr. Brockmann when we found spawning horseshoe crabs on an atypical shoreline. These animals are thought to have been in existence for more than 445 million years, so to observe the surprise and delight of a veteran scientist who was seeing something new after three decades of study was better than witnessing a half-court buzzer beater. Sometimes I have dinner with another professor, Dr. Hyun Jung Cho, who teaches integrated environmental science at Bethune-Cookman University, and I find myself marveling at her commitment to study wetlands and aquatic vegetation at all times – even if she’s wearing a dress on her way home from church and happens to spy a retention pond with interesting grasses. “That’s why I keep rubber boots in my car,” she said matter-of-factly, when I asked if she really waded into these ponds in her Sunday clothes. Even away from the institutes and universities, the scientists among us help shine a spotlight on our world and its living organisms that really should be valued and cherished more than any homerun, slam-dunk, 60-yard field goal or ace in the hole. Michael Brothers, of the Marine Science Center, for example, can look at a gathering of 10,000 seagulls on a beach and identify several different species with one quick glance. 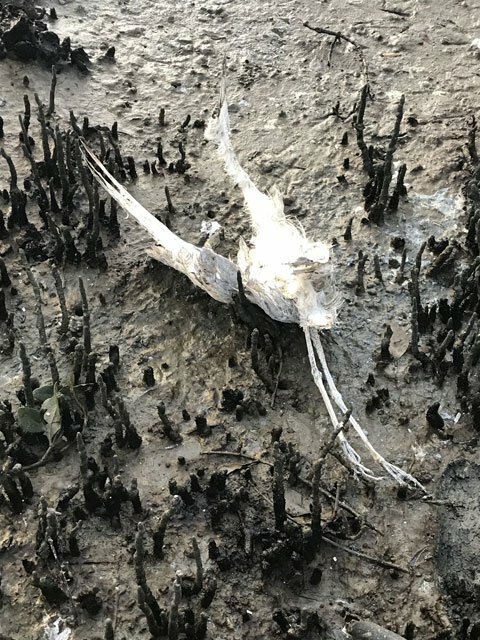 Chad Truxall of the Marine Discovery Center can lead a group to a sandbar and suddenly unveil a host of creatures just under the soil’s surface that could otherwise easily be overlooked. Maybe I’m slowing down as I round the bases in life, but I can “see the pitches” better than ever. These scientists clearly demonstrate skill, knowledge, experience, commitment and passion – asking for nothing and giving everything they have every single time they perform. That’s why I say, if you want to applaud someone for a genuine superstar performance, save it for our scientists. They do their excellent work for the species they study, but more importantly, for the role their species plays in the world. Scientists are looking at history, the present and the future with the hope their respective work can help us better understand our world and what we can do to assure a viable planet. And the passion they show for their work is contagious – kind of like that wave that starts in a stadium and brings true fans to their feet.